After a suspicious package was reported to the Tel Aviv police, the bomb squad worked quickly and efficiently to identify that the suspicious object was indeed a bomb, and neutralized it with the help of a Vidisco’s portable X-ray system. An explosive device placed at the entrance to a convenient store in Tel Aviv was dismantled by Israeli police using an X-ray system made by Vidisco. The bomb was first reported as a suspicious object by an alert citizen during the early evening hours on March 24, 2013 as hundreds of people were walking by. The police arrived at the scene within minutes with increased forces. The police immediately closed off the street and sidewalk for pedestrians, causing traffic jams throughout central Tel Aviv. 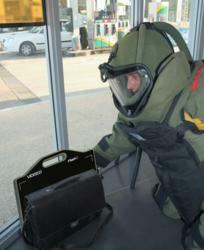 The experienced local bomb squad inspected the object using Vidisco’s portable digital X-ray system and revealed an explosive device. Once the explosive device was detected, it only took minutes for it to be neutralized and for safety and order to be restored to the bustling streets of Tel Aviv. More details on this incident can be found on the Haaretz website and other national media outlets. Two weeks earlier an explosive device exploded in the same location which led to an employee getting injured. Police are now investigating this event as they believe the two incidents could be linked. It is also believed that the bomb was planted there as a result of national criminal activity and not terrorist activity. Vidisco Ltd. is a leading designer and manufacturer of state-of-the-art portable X-ray inspection systems. For a quarter of a century Vidisco has been revolutionizing the X-ray industry and continues to do so with leading products like the truly portable flat panel based digital X-ray systems.